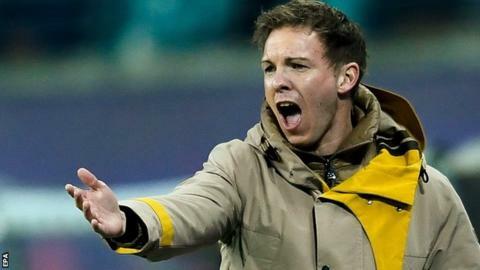 Hoffenheim manager Julian Nagelsmann watched his side earn a 1-1 draw to prevent hosts RB Leipzig - the club he is taking over in the summer - from going third in the German Bundesliga. Former Leicester striker Andrej Kramaric put the visitors ahead in the first half, tapping in his 10th goal of the season. But Leipzig's Willi Orban earned a late equaliser when he stretched to poke in a low cross. Victory would have moved Leipzig above Borussia Monchengladbach into third position and further consolidated their place in the race for automatic Champions League qualification. It was the final time that Nagelsmann, 31, will face his future employers before switching at the end of the season. His appointment as the full-time successor to Ralph Hasenhuttl, who is now in charge of Premier League side Southampton, was announced in June. Sporting director Ralf Rangnick has been in interim charge this season, winning 12 and drawing six of their 23 Bundesliga games so far to leave Leipzig well placed to finish in the top four.